Leland, Whiteville— School is back in session for nearly 2,000 local students this week. These students chose to attend public charter schools offering an alternative calendar and curriculum to that of traditional public schools. These local year-round students are receiving a classical curriculum including courses in Latin, Cursive, and Shakespeare. 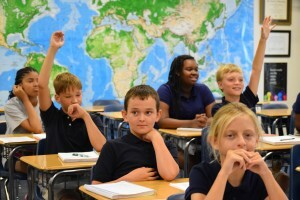 Charter Day School in Leland and Columbus Charter School in Whiteville are K-8 public charter schools offering identical classical education programs in neighboring counties. Further, both of the schools are the highest scoring in their respective Brunswick and Columbus counties. As public charter schools, Charter Day and Columbus Charter are tuition-free and open enrollment. They accept fewer taxpayer dollars in exchange for freedom to offer alternative curriculum and calendar options to traditional public schools, while still remaining subject to the same End-of-Grade testing standards. These schools use Leland-based company, The Roger Bacon Academy, to curate their classical curriculum. Jennifer London, The Roger Bacon Academy’s Dean of K-2 Curriculum, explained that the company has a designated data department which weekly monitors student performance on each lesson and component of K-8 curriculum. “This allows our specialists to perfect our educational programs in real time,” London states, adding that the company has added Science and Latin specialists for 2015-2016. All schools managed by The Roger Bacon Academy provide an identical classical curriculum taught with the Direct Instruction teaching method. In addition to year-round Charter Day School and Columbus Charter School, the family of schools includes Douglass Academy in Wilmington and South Brunswick Charter School in Southport. Wilmington and Southport campuses will begin school on a traditional schedule on August 24, 2015. Public charter schools are available to any NC student, free of cost. Each of the four schools managed by the Roger Bacon Academy is currently accepting new students. For enrollment information, please visit www.rogerbacon.net.